13th April 2019. This weekend, Great Western Railways opened the doors of the Long Rock Maintenance Depot to the public, raising money for the Penlee Lifeboat station and the RNLI. On display was a wide range of old and modern trains and locomotives which have played a part in making Cornwall’s railway a success and during the event, one of GWR’s new Intercity Express Trains was dedicated to heroes of Cornwall in a special ceremony and the train will now carry the names of Rick Rescorla and the Penlee Lifeboat Solomon Browne. The Solomon Browne lifeboat was lost with all hands, on 19 December 1981 when it went to the aid of MV Union Star. All eight crew of the lifeboat and eight passengers and crew of the Union Star were lost. Rick, originally from Hayle, was Security Chief for Morgan Stanley at the World Trade Centre and is credited with saving the lives of over 2,500 people, as he evacuated them from the South Tower on 9/11. 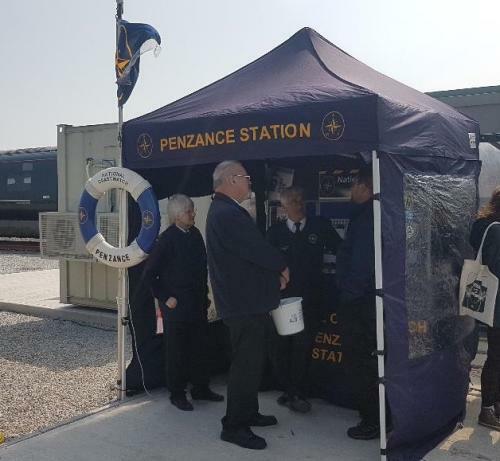 GWR invited the National Coastwatch station at Penzance to have a stall at this event to raise awareness of charity and to promote the use of NCI’s Marine VHF radio Channel 65. The stall was manned by the volunteers from NCI Penzance assisted by members of the adjacent NCI station at Gwennap Head. A lot of people visited the stall and were very enthusiastic to learn about the charity. Dave Stevens, Station Manager at NCI Penzance said “There was a lot of interest shown in the National Coastwatch stand and several of the visitors asked for details on how they can join the NCI. It was nice to work with our colleagues from Gwennap Head and we would like to thank our friends at GWR and the RNLI for hosting our stand”. The photograph shows the NCI stand at the GWR open day.